Get reliable hot water in your home with these top-rated systems. We have reviewed 40 & 50 gallons options plus smaller water heating solutions. According to statistics on Energy.gov, your water heater alone uses more energy than the rest of your entire household appliances combined. It accounts for a whopping 17% of your household’s total energy use. That’s a lot of energy! It goes without saying, then, that if you’re a homeowner who is concerned about energy efficiency, selecting the right water heater is really important. Fortunately for you, we’ve put together this comprehensive guide to hot water heaters to help you with that task. We’ll be telling you all you need to know about water heaters and reviewing the best hot water heaters on the market. Hot water heaters are the systems that supply your household with hot water. They’re an essential fixture in most households that enable you to shower, wash your dishes, do your laundry, and a whole bunch of other things you do every day. There are many different types of hot water heaters that work based on different principles, but they usually look like big metal cylinders. Some people install them in their basements, laundry rooms, boiler rooms, or attics. Conventional tank water heaters are very much the ‘standard’ type of water heater. They’re the most common water heating system used in the US. In 2009, they made up 97% of the water heater market. If you have a water heater in your household already, the chances are it’s one of these. As you’ve probably guessed based on the name, these water heaters consist of an insulated tank to store hot water, as well as a heating mechanism. Unlike tank heaters, tankless water heaters only heat up water as and when you need it. They supply hot water on-demand as opposed to storing it. This is achieved by running water directly from the supply through heating coils, but only when you desire running hot water. Solar-powered water heaters use the sun’s heat to heat your water. The exact process by which they achieve this is complicated, but the long and short of it is that they channel the sun’s heat via roof-mounted cells into a fluid that runs to your water tank. As there won’t always be enough sunlight/heat to power your heater, they usually work in conjunction with a backup system that takes the reins when sunlight alone isn’t enough. Around 50% more energy efficient than gas and electric heaters. Work well in warm and sunny regions and in the summer months. Don’t work very well on cold or overcast days, or in colder regions. Hybrid electric water heaters (also known as heat pump water heaters) use heat pump technology to capture the heat that is in the air and transfer it to your water supply to save on energy. A hot water heater is a costly purchase and one that it’s important to get right - especially if you’re building a new home. To help point you in the right direction, I’ve prepared this buying guide outlining what considerations you need to make. The first thing to consider is what type of water heater you want to use: tank, tankless, solar, or hybrid. To make this decision, you’ll need to consider what you’re looking for. For example, if you have a large budget for installation and you're more concerned about long-term energy savings than short-term, a solar heater may be the way to go. If you want something that requires less maintenance, and you don’t plan on using a lot of hot water at once, a tankless heater may be the best option. If you just want something affordable to purchase and install, and you’re not as concerned about energy efficiency, a standard tank heater might be right for you. You’ll need to consider the size and capacity of your water heater carefully, and whether or not you have the space you need to fit it in your home. Tankless heaters are typically the smallest type, so if you’re short on space, this may be the best option for you. Most tank water heaters will hold around 40 - 60 gallons of water. This matters because it’s an indication of how much water you’ll be able to access in a day. An average household uses around 64 gallons per day, but this doesn’t necessarily mean you need a tank heater that holds more than 64 gallons as you won’t be using that amount all in one go. Generally speaking, though, the more people in your household, the larger tank you should look for. It’s also worth noting that smaller water heater tanks tend to be the most energy efficient, as there is less surface area for heat to escape. A better metric than the capacity to measure how much water your tank heater can deliver is the First Hour Rating (FHR for short). The FHR will usually be given for storage water heaters, and it represents how many gallons of water it can deliver per hour. If you’re unsure what kind of FHR would be sufficient for your household, you can use this tool to find out. The next consideration to make is what fuel type you want to use. This will depend a lot on what’s available and the cost of different fuel in your area. There are 6 main types of water heater fuels to consider: electricity, natural gas, propane, , oil, geothermal energy, and solar. Different types of water heaters are compatible with different types of fuels. This infographic shows you how different fuel type and heater types match up. A safe bet, though, is to stick with natural gas. It’s usually the most economical option and works with most types of heaters. GPM stands for Gallons per Minute. As tankless water heaters don’t store any water (and as such, don’t have an FHR or capacity), this is the rating you’ll need to look at to work out if it provides enough water for your intended usage. To give you an idea of what to look for, a shower uses around 2.5 GPM, and a washing machine uses around 2 GPM. If you plan on running both of these at the same time, you’d need a tankless heater that could deliver at least 4.5 GPM. Another thing to look out for is the BTU rating. BTU stands for British Thermal Unit. A BTU represents the amount of heat required in order to raise the temperature of a pound of water by one degree (F). The BTU rating represents how much heat the water heater can transfer to the water per hour. Before you buy a water heater, you should think about the installation and maintenance. If you’re replacing your existing water heater and want to change the type of heater or fuel, it might mean completely retrofitting your electrical/plumbing system. This can be costly. Make sure that installation makes economic sense before you make any purchase. You should also make sure you don’t need any permits for the installation/changes to your plumbing. Some water heaters require less maintenance than others, depending on the type you choose. Speak with your local plumber if you are unsure of regulations in your state or area. It is recommended by emergency plumbers such as Carford heating and plumbing, to have any damages repaired within one hour if possible. Naturally, you’ll want to purchase a water heater that gives you the most bang for your buck. The best water heater is the one that saves you the most money in the long run. Generally speaking, storage heaters are the cheapest type of water heater to purchase and install. Solar water heaters are the most expensive. However, solar water heaters are also more energy efficient and will save you money on your annual energy bills. Heat pump systems can save you around $300 per year on energy bills but are more expensive than storage heaters to purchase. Tankless heaters could save you around $100 per year but, again, have a higher purchase cost. It also usually works out much cheaper to replace your existing water heater with the same type of water heater. If you switch types - for example, from a tank water heater to a tankless water heater - you may have to pay to have your whole plumbing and electrical systems changed. So with so much to consider, how do you determine which hot water heater is worth investing in? Well, luckily for you, you don’t have to! Other people have already done it. This analysis found that, in most cases, gas water heaters are the lowest-cost systems. Consumer Reports also did a study on the costs of various water heaters based on a heavy use test and found that payback time is longer for tankless units when they replace storage tanks. This means tank heaters offer a faster return on your investment. The exception to this is if you’re installing your tankless heater as part of the construction of a new home, as opposed to replacing an existing unit. The longer the life expectancy, the less frequently you’ll have to replace your heating system, and the more money you’ll save in the long run. So how long do hot water heaters last? Typically, the lifespan of a water heater will be around 10 to 15 years. Tankless heaters have the longest life expectancy (20+ years) and tankless coil water heaters have the lowest (10-11 years). You don’t need to really worry about the lifespan, though, as long as your heater is covered under a reasonable warranty. A good rule-of-thumb when buying a water heater is to look for the systems with the longest warranty. Most warranties are between 3 and 12 years. Those with longer warranties will cost a little more, but it shows that the manufacturer is confident that it will last longer. This means it’s probably made of more durable materials, and will likely have thicker insulation. This also means you’ll encounter less heat loss and save more energy. 1. Rheem Performance Plus - 50 Gal. My top pick for the overall best water heater goes to the Rheem Performance Plus 50 Gallon Natural Gas Tall Water Heater. This is one of the best-rated 50-gallon hot water heaters on the market - and for good reason! The high first hour rating of 77 is plenty enough for even the biggest households. You should be able to run multiple hot water sources (2 showers, plus a washing machine cycle, for example) simultaneously with little issues. It runs on natural gas, which is a lot more efficient than electricity, and the initial purchase cost is also very affordable. Plus, you’ll recoup some of your initial costs on the savings you’ll make on both energy and maintenance. The reason you’ll save money on maintenance costs is that the combustion air intake system means you won’t ever need to clean and replace air filters. Another thing I like about this hot water heater is how easy it is to install, even for those with little DIY knowledge. It starts up safely and easily too, thanks to the push-button ignition. If you’re a conscious consumer, you’ll appreciate the environmentally-friendly low NOx burner. If you live in Utah or California, make sure it complies with regulations in your area, though. In certain counties within these states, all water heaters are required to be ultra-low NOx, so check to see if this meets the required specifications first. This water heater comes with a respectable 9-year warranty. As I mentioned in the buying guide, this is a good indication of the durability. If the manufacturer’s willing to offer a 9-year warranty, there’s a good chance it will last at least that long. While 9 years isn’t quite as high as some of the other water heaters on this list, considering the fact that most tank heaters have a lifespan of around 12 years anyway, it really isn’t that bad. 2. Rheem Performance Platinum 50 Gal. Up next is another heater by Rheem, which isn’t all that surprising considering the fact that they’re one of the most well-respected water heater manufacturers and industry leaders. The Performance Platinum 50 Gallon is probably the best electric hot water heater on the market right now. Thanks to the premium build quality and stainless steel elements, this is a very durable water heater. The manufacturers seem to know that as well, as they offer a very generous 12-year partial warranty period. The 63 gallons/hour first hour rating means that this water heater is powerful enough to provide hot water for a medium-to-large household with up to 5 people. It’s also small in size, which helps with energy efficiency and means it can fit into smaller spaces - perfect if you don’t have a lot of room to work with. My absolute favorite thing about this hot water heater, though, has to be the high-tech features and functions it comes with. It has in-built leak detection to give you more peace of mind, as well as Wi-Fi/smart home compatibility that allows you to link it up to your smartphone or other devices. You can then do things like set the temperature and view information from your phone. It really is a hot water heater for the 21st Century. So what’s the catch? Well, the main downside is that, as we know, electricity is an inefficient fuel source. It’s also a storage-type water heater, and this type of heaters also tends to be a little inefficient, energy-wise. Nonetheless, the fact that it’s an electric tank heater also means it’s economically priced so the money you’ll save on initial purchase and installation should more than cover any extra costs on your energy bill. 3. Rheem Performance Plus 40 Gal. The Rheem Performance Plus 40-Gallon Natural Gas Water Heater is one of the best rated 40-gallon hot water heaters you can get and is a strong contestant for the overall title of the best gas hot water heater. It has a slightly lower capacity than the Rheem water heater (in my number one spot), but the first hour rating is even better, which means it can still provide enough water for most households of up to 4 people. It’s energy efficient too, with good insulation, a 0.65 uniform energy factor and 40,000 BTU/hour low NOx burner. It has lower maintenance requirements than other hot water heater models too as there are no filters to replace. Based on my experience, this heats up your water super-quick and maintains the temperature really well. It has a maximum temperature of 160F but I’d recommend setting it at 120F. I’d also recommend changing the plastic drain faucet with a stronger material, such as brass, to minimize the risk of leakage. The 9-year warranty is a nice addition that gives you extra peace of mind. The Performance Platinum 50 Gallon is the first ‘hybrid water heater’ on this list. It’s also the best hybrid hot water heater on the market. As you might remember from the buying guide, hybrid water heaters are super energy efficient compared to regular storage heaters and can shave a big chunk off your energy bills. The Performance Platinum is the perfect example of that, as it claims to be able to save you up to $4,000 in energy use. The price tag is a little high but you might be able to get some money back through rebates. Plus, you never know, this thing might end up paying for itself over time with the money you’ll save on electricity. As well as being energy efficient, the Rheem Performance Platinum also boasts a respectable 67 gallons per hour first hour rating, leak detection technology, and a generous 10-year warranty. What’s not to like? 5. Sunbank Solar 40 Gal. Finally, we come to the last water heater on our list. And what better way to finish than with the best solar hot water heater system on the market, the Sunbank 40G Solar Water Heater. Solar water heaters are the most energy-efficient type of water heaters, which make them perfect for conscious consumers and households that want to lower their energy bills. The Sunbank 40G is suitable for households of 1-3 people and is incredibly efficient thanks to the clever, well-insulated design that minimizes heat loss. It’s so well insulated, that it’s not uncommon for it to lose less than 10 degrees of heat overnight. Solar water heaters are usually difficult to install, but the Sunbank is actually pretty easy, and shouldn’t take all that long. It might be a little expensive, but with energy prices on the rise, this thing will pay for itself eventually. It’s also virtually maintenance-free, so you don’t have to worry about maintenance bills either. Sunbank has a variety of solar options. You can learn more about them here. Moving on from tank water heaters, next up is the Stiebel Eltron 24 Plus Tempra Tankless Water Heater. In my opinion, this is the best electric tankless hot water heater you can get your hands on, all things considered. The fact that it’s tankless means it provides you with an on-demand, unlimited supply of hot water. You aren’t limited by the amount of water in the tank and can get hot water as fast as the system can heat it up, which happens to be at a rate of 4.5 GPM. 4.5 GPM is probably enough to run a shower and a washing machine at the same time, but not much more than that, so it works better in smaller households with only one bathroom. Another benefit of tankless water heaters like this is the fact that they’re much smaller in size. The Eltron 24 Plus Tempra, in particular, has a very slick design that is super small and compact. You also don’t have to worry about heat dissipation like you do in storage water heaters, so you should be able to shave off around 20% of your energy bill compared to electric storage water systems. Usually, this comes as a tradeoff against higher purchase and installation prices, but the Tempra is actually pretty affordable. Some other things I really like about this heater is how silent it is, how easy it is to install (it only took me around 4 hours), and the ‘Advanced Flow Control’. The only criticism I have is that I’d have liked to have seen a longer warranty period. Usually, tankless water heaters have a lifespan of around 20 years, so a 7-year warranty seems a little short. That being said, it’s not as low as it could be - there are some water heaters with significantly shorter warranty periods. We’ve talked about the best gas storage heater. We’ve talked about the best electric tankless heater. Now, we’re moving onto the best gas tankless water heater. That title belongs to the Rinnai RUC98iN Ultra Series, a water heater that boasts a whopping 9.8 GPM. To put that into perspective, a shower uses around 2.5GPM, which means this water should be enough to run around 4 showers simultaneously. That’s plenty enough for even the largest households. This is also super energy-efficient thanks to the fact that it’s both tankless (so there’s no heat dissipation) and runs on a natural gas fuel source, which is more energy efficient than electricity. It also features ultra low NOx emissions, making it super environmentally-friendly and compliant with new regulations within California and Utah. Another thing I think Rinnai deserve a lot of praise for is the fact that they’ve included a 12-year warranty with this product. 12-years is the standard warranty, and it’s hard to expect anything longer than this as after a decade, your water heater will be nearing its lifespan anyway. The BTU rating is also very high, at 199,000, which tells you a lot about how powerful this water heater is. It should heat up your water very quickly and can heat it to a maximum temperature of 185F. Of course, you’re unlikely to ever need to set your temperature that high, 140F should be plenty. The Eccotemp L10 2.6 GPM Portable Tankless Water Heater represents a significant deviation from the kind of water heaters we’ve talked about so far. Unlike the others, which are designed for residential use in regular households, the Eccotemp is designed to be taken on the road. It’s my top pick for the best on demand hot water heater for RVs. It runs on propane, which makes sense considering the fact that you won’t always be hooked up to a natural gas line. It’s also designed to be easy to carry, so it’s incredibly small and lightweight. It’s great for people that are looking for a water heater they can take camping. Naturally, this isn’t exactly a powerful water heater, and your flow rate is limited to just 2.6 GPM. That means it won’t be able to supply hot water to multiple faucets at once, but it’s plenty enough for the kind of things you’d be using it for on a camping trip (i.e. showers, washing your pets, washing dishes). The maximum temperature is 140F, which should be more than hot enough for a nice shower. One thing I like about this water heater is the safety shut off feature. It’s activated whenever the unit is left running for more than 20 minutes, or when it’s tilted at an angle greater than 45 degrees. These kinds of safety features are especially important for a portable water heater like this, as you’ll be handling it a lot. Another thing I like about it is how easy it is to use. It doesn’t take a genius to install and you can hook it up to a garden hose in minutes. The catch? Well, it’s not exactly a ‘high-quality’ water heater, which is only to be expected considering the price. It’s not very durable and some users have reported leaks. It also only comes with a 1-year warranty, so don’t expect it to last for over a decade. The Camp Chef HWD5 Triton Water Heater is, in my opinion, the best portable hot water heater you can get. This isn’t the kind of water heater you’d use in your house, it’s designed for people who want to take it with them so they can shower and access hot water on the go. It’s perfect to take with you to the beach so you can wash the sand off your feet after a dip in the sea or when camping. It also works great as a makeshift outdoor shower that you can put together yourself with little to no hassle. The water heater comes complete with a shower head that features 4 settings: mist, jet, shower, or off. Water temperature can vary a little. It also has a hook on top so you can hang it up wherever you are. It runs on propane and has a GPM of 1.5. That’s the lowest flow rate of any water heater I’ve mentioned so far, but it makes sense considering what this thing is designed for. It’s not going to give you a lot of water pressure, and the heat of the water can fluctuate a little, but it’s enough for a quick, warm shower while you’re out and about. Natural gas is probably the most common fuel source used in tank water heaters, and for good reason. It’s a much more efficient fuel source than electricity, as electric water heaters tend to be relatively inefficient systems. It’s suitable for households that are hooked up to a natural gas line. Natural gas heaters tend to cost more than electric heaters in terms of initially buying the unit. Liquid propane is similar to natural gas. It works in the same way and is only really used when natural gas is unavailable. You can purchase propane tanks and have them shipped directly to your property to supply your heater. Electricity water heaters are inefficient compared to other fuel sources. It’s also substantially more expensive than propane and natural gas. On the flip side, they’re also cheaper to purchase and install in the beginning. They don’t require venting either, so they’re easier to install in households that don’t have venting. Solar energy is essentially using the sun’s heat to heat up your water. Heat from the sun’s rays is absorbed by a series of panels that sit on your rooftop. They transfer this into a fluid that is stored in tubes beneath them, and this fluid them warms a heat exchanger to heat up your water. Solar energy is usually used in conjunction with another fuel source but can cut a big percentage of your heating bill. In some cases, as much as 80%. Government rebates can also be on offer for these systems. Geothermal energy is exclusively used in heat pump water heaters. It works by absorbing heat from the air and transferring it to your water via electricity. This kind of energy tends to be a lot more efficient than electricity, but heat pump water heaters but tend to cost more and are only suitable in regions with consistent temperatures that stay between 40 and 90 degrees. A gas tank water heater works by funneling water into a tank from a supply pipe, then using a gas burner below the tank to heat up the water. By products such as carbon dioxide are vented out of the top of the system and through a chimney or wall vent. The heated water is then transferred to your faucets via a pipe that connects to your plumbing. In electric systems, the electric water heater unit connects to a 220-volt circuit. A current is passed through two heating elements: one in the middle, and one in the bottom of the tank. A thermostat controls the power delivered to these heating elements by sensing the water temperature and closing and opening to enable or disable the current flow, depending on the whether or not the water is already at the maximum allowed temperature. All vents should be free of dips, go up and out of your home, be the correct size for your tank, and be properly screwed in. This will ensure that harmful gases don’t accidentally end up in your home. Leaving flammable object/liquids or combustibles near your water heater is a disaster waiting to happen. If your water heater is in a cupboard, make sure that same cupboard is free of things like flammable liquids and rope. Temperature valves are a really important mechanism for releasing pressure and preventing catastrophic explosion, but these valves can sometimes fail, which is why it’s important to test them regularly. You can do so by pulling the handle upwards and checking that water flows freely, and stops when the handle is released. The drain lines should NOT go up. If anything unexpected happens, get it professionally checked or replaced. Just in case harmful gases are entering your home due to poor ventilation, it helps to have a carbon monoxide monitor installed. This monitor will warn you before you get carbon monoxide poisoning. How to drain a hot water heater? Step 3: Attach one end of a garden hose to the drain valve, and another somewhere it can safely drain (outside). Step 6: Close the drain valve and remove the hose, turn the water supply back on until the tank is full, and tank the heater back on. How to replace a water heater thermostat? To replace your thermostat, start by making sure you’ve disconnected the power on your water heater, then remove the access panel. Next, make a diagram of how the wires are connected or take a picture, then remove the wires. You can now gently pry the thermostat out from the bracket, one side at a time, taking care not to damage the bracket, then replace it your new thermostat by sliding it into the bracket so that it locks in place. The next thing to do is replace the wires exactly as they were on the old thermostat using your photo or diagram, then put the safety cover back on and restore power to the water heater. Leave it for an hour or so before you test your hot water. What is the best water heater temperature setting? Most water heaters come pre-set from the manufacturers at 140 degrees. This is okay, but the Department of Energy actually recommends setting it to 120 degrees instead, so you might want to change it to this temperature. What size breaker do I need for a 30-gallon water heater? Breaker sizing is complex and depends on a number of factors. It’s best to consult a qualified boiler technician to get advice on what size breaker you need for a 30-gallon water heater. 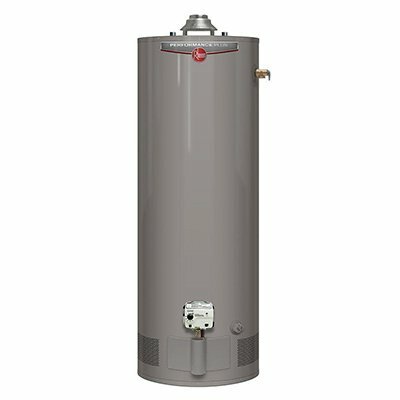 Do I need professional plumbers to install a hot water heater? It’s always advisable to get a qualified, licensed, professional plumber or boiler technician to install your water heater, as opposed to doing it yourself. Hot water heaters can be very dangerous. As you’re working with hazardous systems, safety is paramount, which means you should hire someone that knows what they’re doing. In some jurisdictions, it may even be illegal to install it yourself if you don’t have the correct license, qualifications, or permit. You can start by thinking about how much water you typically use. If there are lots of people living in your household, you’ll probably want to get a water heater with a larger capacity. You should also think about where you’ll place your water heater and take measurements to determine what dimensions will fit in the space. Generally speaking, water heaters tend to last around 10 - 20 years. Different types of water heaters tend to last longer. If you’re using a tank water heater, expect it to last around 12 years or so. That concludes this ultimate guide to the best hot water heaters. If you haven’t decided on what hot water heater to buy just yet, I’d recommend getting the Rheem Performance Plus Natural Gas Water Heater. It’s an all-around great water heater that you really can’t go wrong with. Good luck with your new water heater, stay safe, and enjoy your warm showers!